In the Cloud – a private VAT registered SA company – was established as a result of being awarded #LIASA Librarian of the Year. Thank you to all who have made this possible! It is #liasa18 conference again, and this time round I have to present a poster on what I did with the award money. The community training digital citizenship workshop at Hindle High, Western Cape, was definitely one of the many highlights of the past year. Below the poster compiled for #liasa18. Upcoming Digital Citizenship Training for Learners, Students, and more! 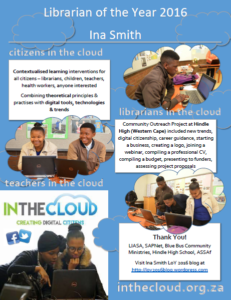 In the Cloud Featured in LIASA-In-Touch! Creative poster design workshop for librarians so much fun!